You know what they say about all work and no play? Well, in this fun-loving mecca for gamers, you can make sure things never get out of balance. For all ages, a good place to start is Ballard’s Full Tilt (5453 Leary Ave NW; fulltilticecream.com), a nighttime hot spot for its innovative ice cream flavors, choice beer selection, and dozen or so pinball machines. Up the street, Cafe Mox (5105 Leary Ave NW; cafemox.com) doles out sandwiches and draft brews in a cozy space, where visitors can mosey into the attached Card Kingdom (cardkingdom.com) store to borrow a board game. The shop also hosts regular card tournaments, when players can throw down in Magic, Netrunner, and more. More great eats and games can be found within the brick walls of King’s Hardware in Ballard (5225 Ballard Ave NW; kingsballard.com). Find diners digging into locally sourced beef burgers—like the After School Special piled high with peanut butter and bacon—before racking up points in Skee-Ball. Brave Horse Tavern (*310 Terry Ave N; bravehorsetavern.com) in South Lake Union is another high-scoring spot that’s known for its elevated comfort food and shuffleboard tables. Keep on playing at Add-a-Ball (315 N 36th St, Ste 2B; add-a-ball.com) in Fremont and John John’s Game Room (1351 E Olive Way; johnjohnsgameroom.com) in Capitol Hill, both go-to “barcades” for the drink-swilling, pinball-playing, old-school arcade crowds. If you prefer to unplug, make your way over to Capitol Hill’s Auto Battery (1009 E Union St; autobatterybar.com), a sports bar in a converted auto-body shop that’s now home to air hockey, pool, foosball, shuffleboard, and more. 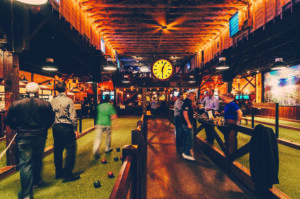 Or add Rhein Haus (*912 12th Ave; rheinhausseattle.com) to your nightlife list to get the German beer hall atmosphere—with pints of bier to boot—and some seriously impressive indoor bocce courts. Article written by Chelsea Lin for the Visit Seattle Official Visitors’ Guide.